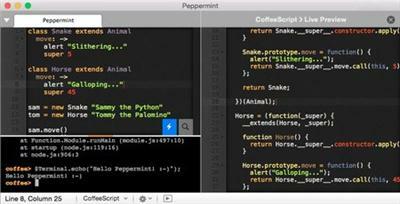 Instantly Run/Preview your code, without ever leaving Peppermint, for over 30 different programming languages. Advanced Editing at your fingertips: Snippets, Autocompletion, Incremental Search, Multiple cursors, Advanced Search&Replace with Regex, Smart Undo-Redo and More! Dozens of plugins/extensions for everything you need: live preview your HTML, convert LESS or Markdown, beautify CSS/JS/HTML, complete FTP/SFTP support, Regex Editor, share your Gists! With more than 10 different built-in dark & bright themes to choose from, adding some colour to your coding life has never been easier. OSX 10.7 or later. 64-bit processor. 100% Yosemite-ready.